Each Box contains One Autograph, One Memorabilia Card, Three Premium Edition Inserts, and One Numbered Premium Edition Insert! Look for Saquon Barkley and Sam Darnold Autographs! Also find 14 other Inserts, Two Stickers, and Six Parallels Per Box! Classics Football returns for the 2018 NFL season! Find a 300-card base set that features 100 cards each of veterans, legends of the game, and the newest rookies! For the first time, find Classics Premium Edition parallels printed on Opti-Chrome technology! On average, every box of Classics delivers four Premium Edition parallels, one of which that is #'d/175 or less! Find one autograph and one memorabilia card in every box of Classics, on average! Look for hard-signed Buybacks that include cards from 1988 to 2017! Be on the lookout for Premium Edition autograph cards! Classic Combo Signatures features ten incredible pairings of legends of the game! Look for the debut of Vintage Sticker inserts in Classics! Three different inserts can be found - Vintage Logos, Team Pennants and Award Winners! 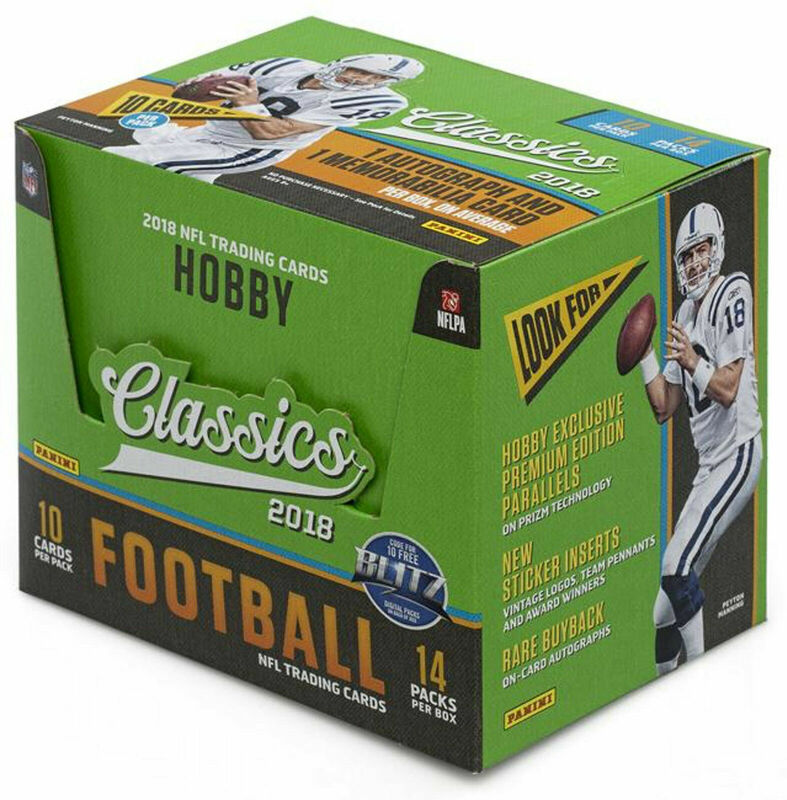 On average, every box of Classics will deliver two sticker inserts! Need more Boxes??? Email us on this Box or other Wax Boxes - Buy Direct & SAVE! BOX & PACK PLEDGE: All Boxes are factory sealed and packs are guaranteed to be freshly taken from a hobby box. Nothing has ever been searched in any way. You will get what you should get based on the odds from the manufacturers. Others sell cheap or below cost for a reason. Integrity is something Rookies HQ strongly believes in and why we have been in business for so long. We combine shipping on all orders. We ship out orders 6 days a week and generally most orders do ship within 1 business day. If you have a need to overnight or 2 day FED-EX, please contact us (goolgle us) and we can determine the cost of your special requirement. International orders may require additional postage and depending on the cost of the order, we may require Global Express Mail with Signature or FED-EX International Air Mail.